Plasencia (Spain) has been the core of the Spanish forest science since 26th to 30th June 2017 thanks to the VIIth Spanish Forestry Congress. This congress channelized the results of multiple research projects, exchanging and proposing new ideas between participants and making the attendants to participate in enriching debates. Every four years, the Spanish Society of Forest Sciences organizes this Congress. This time its motto has been: “Management of the forest: environmental services and bio-economics”, highlighting the role of good management of forest ecosystems as a guarantee for economical development based on its sustainable use. A research paper has been presented at this conference within the framework of the Nirwood Project. 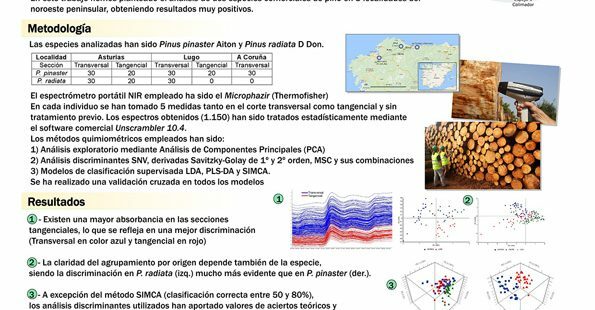 It shows the results of an experiment carried out in 2016 using NIR technology on two pine species (Pinus pinaster and P. radiata). 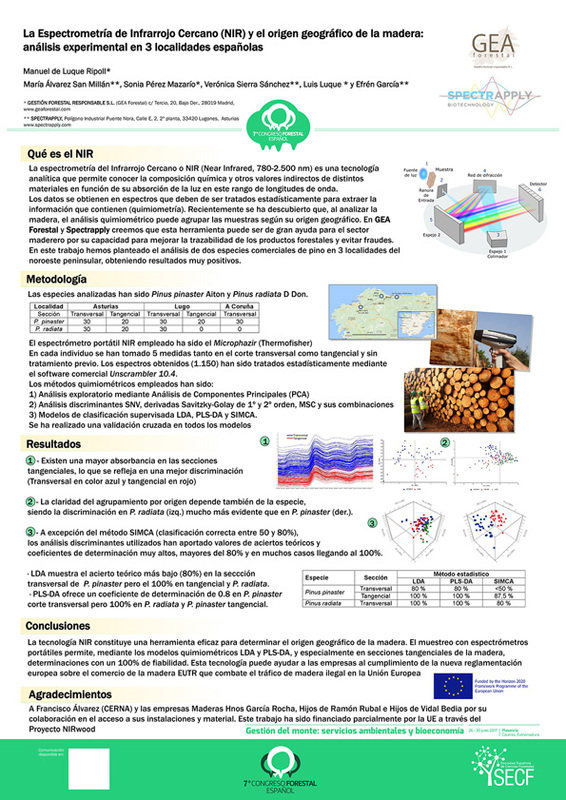 The objective of the work was to determine the ability of the NIR method to discriminate the geographical origin of very close samples and to differentiate between species simply through its NIR spectral features. We also wanted to know the influence of the type of section (tangential, transverse) on the results and to establish which one shows a better reflectance and, therefore, a better quality. Fresh samples and dry samples (weathered for months) were also compared. In all these variables we obtained very positive and useful results. In addition, the work served us to refine our field work methodology that will be used in the future for our NIRWood project. You can also watch all the technical Publications related to Nirwood Project on this section.